THHG Book Club: The Joy of Drinking. 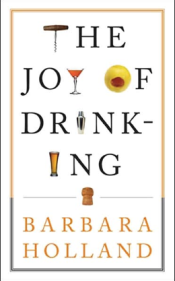 From the opening lines of Barbara Holland’s THE JOY OF DRINKING, (where she puts forth a (convincing) argument that fermentation and alcoholic drinks had much to do with the creation of civilization,) I was hooked. This book had me laughing out loud every few minutes while actually teaching me a thing or two. The hilarious stories on the history of drinking and its worldwide appeal through the centuries are far too many to recount. I’ll just say that she manages to share stories about Julius Caesar, Alexander the Great, Oliver Cromwell, Marco Polo, Queen Victoria, Mark Twain, George Washington, John Adams, Carry Nation, Winston Churchill, William Faulkner and a parade of other historical notables. She also details some of the more…interesting… brews that man has concocted, including something called “airag”, made by nomadic Mongolians. Because the Mongolians don’t stay put long enough to grow things to ferment their options are limited, but man always finds a way and their solution was to ferment mare’s milk. I’m sure the Mongolians are fond of it, but her descriptions left me none too eager to give it a try (but when we shoot our Mongolian episode I’ll be game if Scott and Jimmy are…). Holland meanders through history, from primitives to Pilgrims to Prohibitionists and is charming and informative and ridiculously funny throughout. It’s an interesting commentary on attitudes and how we’ve gotten where we are. She also makes clear that this isn’t a “human only” pastime by telling us of possums climbing trees to get to fermented apples, getting drunk and falling down or entire flocks of birds getting tipsy on fermented berries. Furthermore, she argues the case for pubs, taverns and bars as third places very well. A fun and easy read, I can’t recommend it enough. In fact, I’m going out to find a copy of Holland’s “Endangered Pleasures; In Defense of Naps, Bacon, Martinis, Profanity and Other Indulgences”. I hope someday I can share a drink or two with Barbara Holland. She sounds like fun. To say the least.